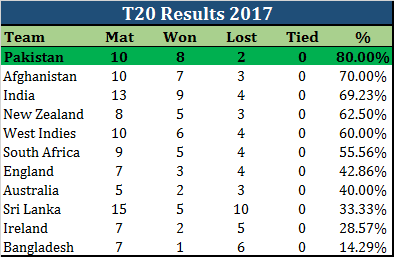 2017 was quite a year for Pakistan Cricket. They won the Champions Trophy for the first time joining India, Sri Lanka and the West Indies as the only teams to win all major ICC trophies. Pakistan won their first ever Test Series in the West Indies as Misbah and Younis bid farewell to the game. Fakhar Zaman hit a memorable maiden ODI ton in the final of the Champions Trophy. Hasan Ali became the number 1 ranked ODI bowler becoming the first Pakistani pacer to reach that ranking since the hey days of Wasim Akram in the 90s. Imam Ul Haq hit a debut ODI century giving Pakistan another talented batsman. Babar Azam's limited overs stock continue to grow with more centuries. New talents like Faheem Ashraf, Shadab Khan, and Rumman Raees continued to shine. Aamer got Kohli twice in as many deliveries in a year when not many bowlers could claim to have got him even once. 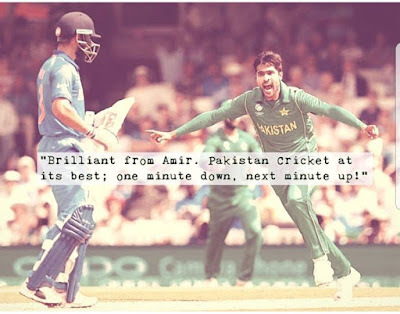 It was an exceptional spell of bowling by Aamer as he dismissed the tournament's top 3 leading run scorers - Kohli, Rohit, and Dhawan - inside the first 10 overs and sealed the final for Pakistan. In 2017, Pakistan's limited overs team had quite a turnaround with impressive performances in ODIs and T20, unlike in prior years. Definitely that had something to do with the injection of new blood. At the same time, Pakistan's test performance declined with the departure of stalwarts and despite winning their first ever series in the Caribbean, Pakistan also lost their first ever series in the UAE since it became their adopted home. 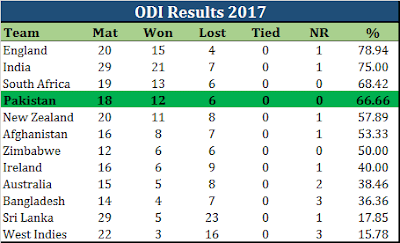 As you can see, Pakistan was the best performing T20 team, the 4th best in ODIs, and a low 7th in tests. 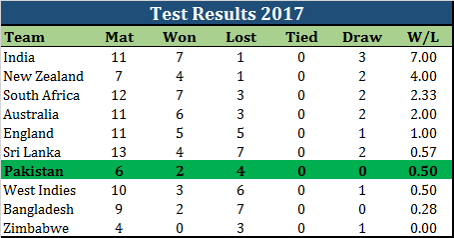 In Tests, Pakistan's batting did not do much to write about. 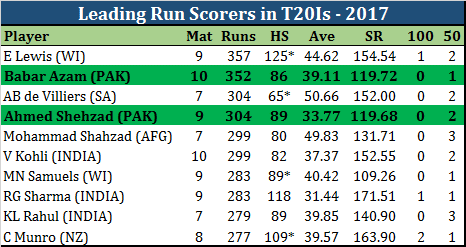 Azhar Ali was the leading run scorer with an average of 42.00. With the departure of Misbah and Younis, the likes of Azhar and Asad will have to take charge as the new blood will surely take time to settle down in international cricket. In ODIs and T20s, Babar Azam emerged as Pakistan's new star. 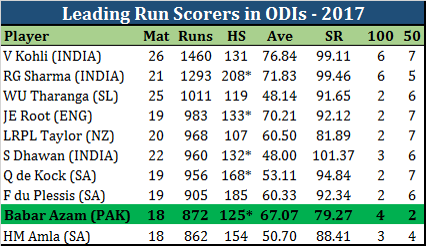 He was among the leading run scorers in the world in both formats - 9th in ODIs and 2nd in T20s. 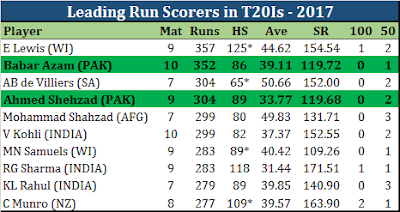 Surprisingly, Ahmed Shehzad was also one of the top scorers in T20s. In ODIs, Babar's average was behind only Kohli, Sharma, and Root. And his tally of hundreds was behind only Kohli and Sharma. In Tests, Yasir Shah continue to shine for Pakistan ending the year with 43 wickets to his name in only 6 test matches. Imagine how many he would have taken had he played as much as some of the other bowlers. 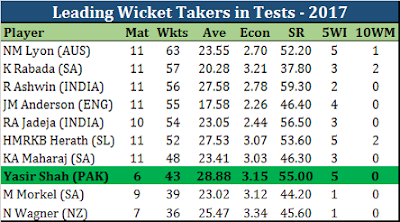 Yasir was the only bowler to pick up an average of 7 wickets or more in the tests he played. No other bowlers averaged even 6 wickets per match. ODIs were dominated by Pakistan's newest pace sensation - Hasan Ali - who improved with every game that he played. 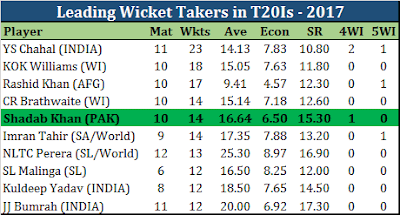 No pacer came even close to his tally of wickets, average, and strike rate. He even had the most 5 wicket hauls in the year. 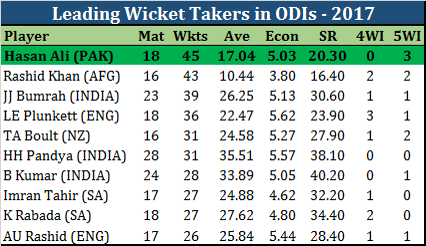 The only bowler who had a better average and strike rate than Hasan was Afghanistan's spin maestro Rashid Khan. 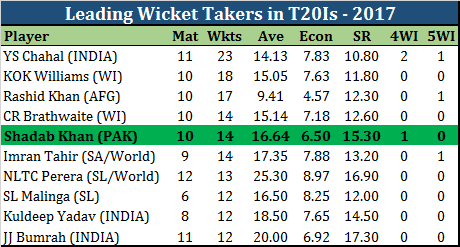 In T20s, it was young leg spinner, Shadab Khan, who impressed finishing the year with the 5th highest wickets. He had a very impressive economy rate as well, which was bettered by only Rashid Khan. It seems like Pakistan's test team will take some time to get back to the heights they had reached with Misbah at the helm, coupled with Younis as the guiding force for the batting line up. However, in limited overs, Pakistan should continue to impress with all the new youngsters standing up to be counted. Pakistan's ODI team has not been this exciting since the 90s. They have a talented opener in Fakhar Zaman and another one waiting in the wings - Imam Ul Haq. They have one of the most impressive batsman produced by the country in Babar Azam. The bowling stocks are abundant with spinners like Yasir Shah, Imad Wasim, and Shadab Khan; and a pace battery comprising Mohammed Aamer, Hasan Ali, Rumman Raees, Faheem Ashraf, Mohammad Abbas, and plenty waiting in the wings. To top it all, the likes of Hassan, Faheem, Imad, and Shadab are all quite handy with the bat. Surely we are in for some exciting times for Pakistan Cricket.